These elephants are damaged goods. They are abused children, mom’s, and wayward sons. Most were captured from the wild as babies and have endured decades of trauma and abuse while being carted around Asia in the backs of trucks from venue to venue like circus rides. They will snap eventually. Every year at least one tourist is killed by a disgruntled elephant in the tourist trekking industry in Thailand. This February a Scottish tourist was gored to death in front of his daughter while on an elephant safari trek in Koh Samui Island. Gareth Crowe had no idea that his life was about to be cut short by a disgruntled elephant and his daughter would be left with the trauma of watching her father get gored to death. They were on holiday, on a typical Thailand packaged tour. But if they had seen our film he might be alive today. Every year 28 million tourists flock to Thailand and are shepherded along the tourist trails including several packages – rafting, caving, climbing, diving, yoga-retreats, zip-lining, performing animal venues, and the most popular, the mother of all Thailand experiences – elephant trekking. People usually don’t even choose to go on an elephant trek. They just do. It’s in the brochure, part of the package. 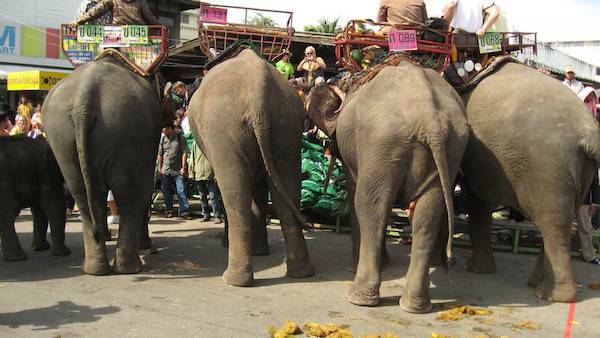 And in my years of investigations in SE Asia I have yet to hear a single tourist inquire about the history or disposition of the 6,000 pound wild animal they are putting their kids on top of. Let me say this, you are putting your lives and the lives of your children at serious risk when you climb on the backs of wildly traumatized and very powerful animals. Every year at least one tourist and several elephants die in elephant trekking related incidents in Thailand. I made a film about this for a reason but nobody seems to be listening. These elephants are damaged goods. They are abused children, mom’s, and wayward sons. Most were captured from the wild as babies and have endured decades of trauma and abuse while being carted around Asia in the backs of trucks from venue to venue like circus rides. They will snap eventually. And when they do, it is not pretty. It does not take a genius to figure this out. Abused people snap. Elephants are no different, just a lot bigger… and better looking. And when they do attack and kill, they are punished severely for it, perpetuating the hostility. But you know what, it’s not in an elephant’s nature to kill humans so it’s just as traumatic for them when they snap. Elephants are not vengeful animals by nature. We teach them this behavior through antagonistic training. And we continue to do it by condoning the cruel businesses that capture these animals for human entertainment. If you want to learn the reality of the elephant trekking industry (yes, it is an industry) then check out our film How I Became An Elephant about a 13 year-old American girl who ventured to Thailand to get involved and make a difference.